De geschiedenis van de CJ750. Written by Ben Van Helden (c) with some help of Bart Sanders (history of the Ural). Tom van Endert, "Mit und Hammer Schlüssel, Mons Stein & Vannerdatt, Muenster", Stefan Knittel, BMW Motorräder, BMW Archive, URAL, IRBIT and many sites on the Internet. The History of the Chang-Jiang. From Bmw to Chang Jiang. I wrote this text in Dutch. Translated in in English by Google and reworked it. If you have anything to contribute please send me an email by clicking on this text. This is the story of a machine with a long history and a production period of 64 years. Begun in 1938 and more or less stopped in 2002. Stopping is actually not the proper sense of the word. I found some information on various sources on the Internet, see the link page. The history and the personal archive was an important source. Bart Sanders sent his contribution on Ural / Dnepr in this story. What exactly is true, will always remain a gamble because the right information is difficult to find. Anyone who knows more is asked to contact me so that we can completethe history of the Chang Jiang 750. He was born in 1938 as BMW R71, moved to Russia and received the name M-72 (1942-1963). Finally landed in China as Chang Jiang 750 (1957-2002). Meanwhile, the design evolved a bit but remained basically close to the starting point. 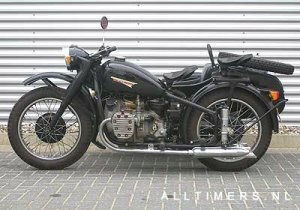 It was a design from the thirties and some parts now produced in China are still compatible with a BMW R71, at least with the old Urals. His history is the story of the journey of a design from Germany to China trough the Soviet Union. Official reports have been lost or withheld as a state secret, so that this history consists mainly of presumptions and theories that are supported by scant evidence. 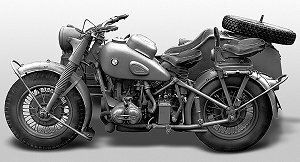 BMW R 71 When in 1935 Germany's universal conscription was introduced, there were also made "Kradschützentruppe". Composed of soldiers who fully equipped with sidecars may come fast at the front. 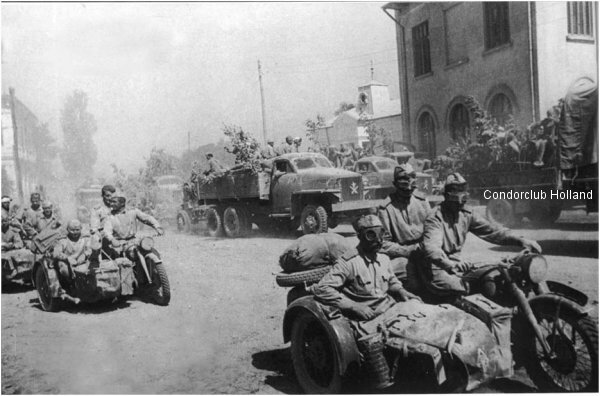 They mainly used motorcycles that were converted civilian models and not specific developed for the army. The German army had chosen the old R12 instead of R71. It was meant as a citizen bicycle and too modern for the army. There are therefore few R71 engines built for the army. Most of the used bikes were painted gray civilian models. The BMW R71 was a great technical step forward then. The model paved the way for many improvements including future models of BMW benefited. 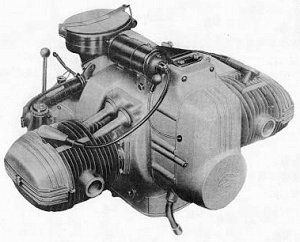 The engine was a side-valve boxer with a square bore and stroke ratio that produced 22 horsepower. The pressed steel frames used until then (R12) were replaced by a very strong oval tube construction where better a sidecar can be hung to. An important innovation was the front and rear suspension. On the front an ultra modern telescopic fork at the rear plunger suspension, which proved to be very suitable for a sidecar machine. Other brands were experimenting with this type of rear suspension. At BMW they were so happy that it remained in use until 1955. A single R71 is thus used by the German Wehrmacht. Only they did not like it. Too little ground clearance, too weak and / or too heavy to make the necessary 3 soldiers with full armor plus MG to transport in swampy terrain. The R71 is bought by the German Post and a small number being sold to private individuals. There are still 3458 eventually built. During the war periodically R71 sidecars will seen in the German army, however, it concerns recovered machines. - Tyre size equal to that of the Volkswagen, 4.50 X 16. - High-mounted fenders had to be able to use snow chains. - Fuel Inventory enough for 350 kilometers. - Top speed 95 km/h and the cruising speed 80. - Ground clearance 15 centimeters. - Weight up to 250 pounds and maximum payload 250 kg, no more than 500 pounds. In 1939 were the first results are displayed to the army command. BMW came up with a proposal, the R75. This made the R12 and 71 in one blow old-fashioned. In the mean time in Russia. 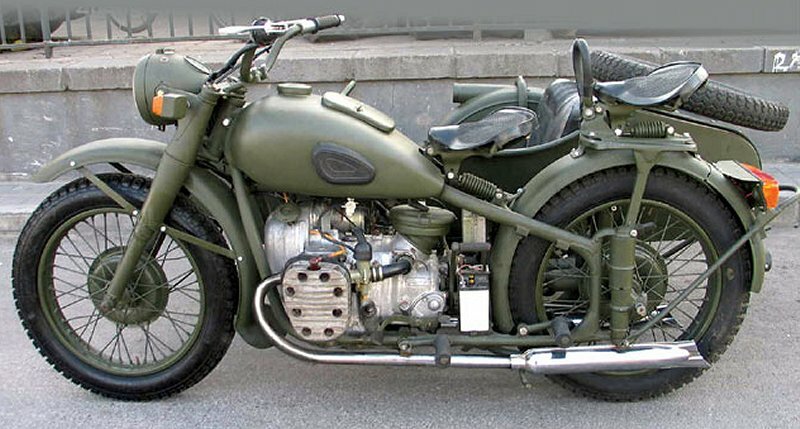 PMZ 750 Russia began in the mid thirties to modernize its army and sought a replacement for their rather outdated V-twin PMZ750, and the somewhat cumbersome ISH1. There was no time for a new design. The gaze was directed to the west and a BMW meet the requirements. Also in the Netherlands was chosen for the R12. Since then there were quite a few in the Holland, just before the beginning of the "big misunderstanding" with the neighbors. In the U.S. they were not sleeping and the army wanted a boxer so Harley and Indian were ordered to produce 1000 samples. The model came too late as the Jeep already had taken over all functions of the heavy sidecar. Harley gave much later that they have made a direct copy of the BMW R71, the XA. Indian developed a different concept: the transverse V-twin Model 841 (1943). Of these, there are no more than 1000 made. It could very well be an example for the Guzzi V7. Preparations for an inevitable war forced Germany to devise ways to circumvent the Treaty of Versailles. They developed a strategy to collaborate with companies in foreign countries where they do everything that could be built in the Convention was prohibited. Thus produced the Russian company Zavod Uralmoto motorcycles (or just the parts) in cooperation with BMW. There was thus already a connection. Russia had up to about 1933 a commercial treaty with Germany at that time and there were regular exchanges of engineers. Even with BMW in Munich. There are a number of Russian engineers at the BMW R16 development involved. Russia and Germany signed a pact known as the Molotov-Ribbentrop Pact. Also called non-aggression pact or non-attack treaty called. It was signed in Moscow on August 23, 1939 by the Soviet Foreign Minister Molotov and German Foreign Minister von Ribbentrop. Both sides benefit from this agreement. Russia had now access to German technology and Germany could really use Russian production. On 1 September 1939 Germany invaded Poland and Russia did the same on September 17. Then they divided the spoils. It would be more or less logical that the technique of the R71, which is not used by the German army, under the pact came into the hands of the Russians. As long it would take. 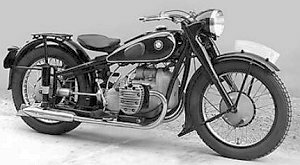 The Wehrmacht therefore put its cards on the Zündapp KS750 and BMW R75, which are built in huge numbers during the war and swarming over the entire European continent but almost all are destroyed. Meanwhile, both Russia and Germany know that the clock is at war and both countries are preparing for a big neighbors fight. 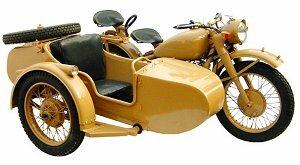 Russia knows that its own industry in 1939 cant provide a reliable sidecar motorcycle for the military. Time presses, and Russia needs war material, including a nimble, fast and flexible motorcycle sidecar. On the picture just to see that the first models had a narrow and low fender. There are two scenarios on how quickly Russia has become the necessary construction. Under the first scenario, BMW sold all drawings to Russia by the agreements under the non-aggression pact. It seems rather unlikely, especially since BMW in its archive has no information about it. This scenario is not completely out of thin air. BMW wanted to do something simple in return on the investment made in the development of the R71. But, as mentioned, there are no known evidence of this scenario but it is most likely. Under the second scenario, Russia bought via neutral Sweden a few engines and copied it in drawings, materials and tools. Given the time required, this not a realistic scenario. A dedicated team of mechanical engineers and materials specialists (all metals and alloys to be analyzed) gets in a year a decision on construction paper and can then begin production preparations. Perhaps in 1939 this was a very high expectations of Russian technicians. If you're so good you can make your own new engine in a year. Because now we look at history from another point of few the second scenario is somewhat unlikely. There is much technical knowledge to such a difficult feat to pull the socoled "reverse engineering". As we look at it now this story is a perfect piece of Russian propaganda, because it was hard to swallow that the technology came from Germany, the enemy. Better was to have the honor to get to you and not to say the engine was "bought" in Germany. Why would they buy engines in Sweden if there were good relations with Germany and BMW? Anyway, in 1941, the first M-72 engines running in Moscow of the productionline. The "M" probably stands for Moscow, because the motors encoded to a <city> - <number> schedule. Thus, there is also such an L-300, a 300cc DKW copy that was built in Leningrad. M-72 The production runs at full speed as Germany attack on Russia in June 1941. Hastily they moved the factory from Moscow. First to Gorky later to IRBIT. In Gorky can still be built around 2000 M72 while IRBIT production was difficult to get going. It was cold and had long supply lines. Many machines were simply in the open air because there was no place in the former brewery. Only the end of 1942 IRBIT produces in greater numbers for the Red Army. The M72 appears to be a big success. In the field show the design really good performance and is very reliable. The M72 was produced in different factories and were later Ural (IMZ) and Dnepr (KMZ) renamed. 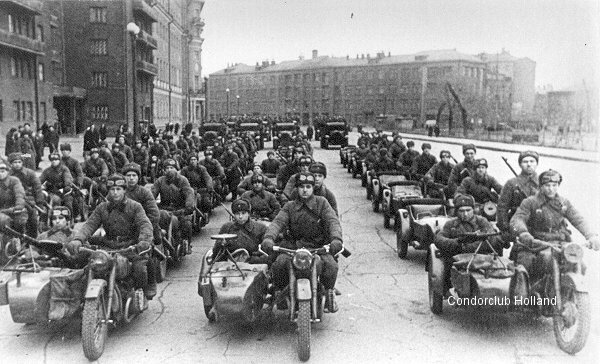 The Red Army continues orders for M72 sidecar motorcycles to 1958 . With minor improvements and adjustments along the way, the M72 in 1958 is far from the end of his rope. At the end of the war Eisenach falls into the hands of the Russians. There stood the factory where the BMW R75 was produced. The whole plant, including production equipment and components, was shipped to Russia. This knowledge will be used in the further development of the Ural and Dnepr overhead-valve models. 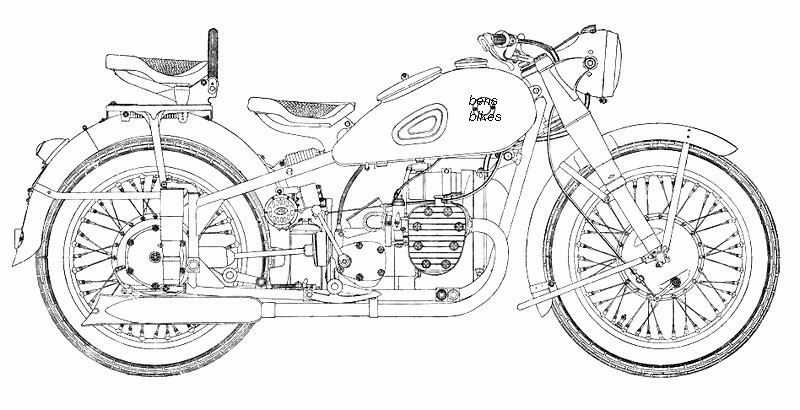 The Russian five-year plan in 1957 includes a further development of the indigenous motorcycle production. Meanwhile, there is a huge domestic demand for reliable and cheap transport and transport that simply must be maintained "with a hammer and a wrench." The M72 was built to 1957 does not fully comply with these future plans and both IMZ and KMZ are instructed to realize the overhead-valve models. Only KMZ builds the M72 until about 1961 continued as M72-M. 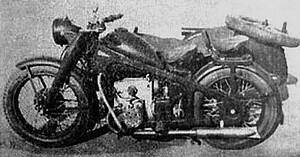 The sidevalve engine will still be produced a while longer, but in fact is the on the BMW R71 based machins is outdated in Russia. Over 30 years of manufacturing and use under the most severe (war-) conditions is not a bad result for a structure that Germany itself was not very excited to receive. In China began in 1949, under the leadership Mao Tse Tung, the industry of the country to develop a sidecar combination for the army. Until that time the emphasis was on the development of agriculture and not on technology. 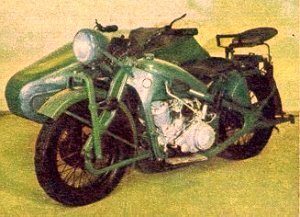 In 1950 developed the "Beijing No.6 Automotive Works" a military motorcycle for the "Peoples Liberation Army" (PLA) with the assumption of a Zündapp KS 500. There were 4248 of this machine made ​​in the factories in Hongdu and Xingjiang. See the somewhat blurry plate left. In 1953, China started its first five year plan under the supervision of "great friend" Russia. That is the great leap forward called. There was great demand for military equipment because China wanted to profile the rest of the world, read U.S. Korea and Tibet are in 1950 examples of Chinese expansionism. The Chinese army, the PLA had great need for a decent sidecar vehicle that is easy to maintain. The Russians were able to sell between 1953 and 1957 many industry to China, which in turn yielded many agricultural products to Russia. Thus, more than 300 complete factories supplied to China, including an motorcycle factory with the now somewhat outdated M-72 production. The production of IRBIT (or Gory) is dismantled and rebuilt in Nanchang. Initially IMZ delivered parts to complete assemble machines. Meanwhile, parts are replaced by copies produced in China. Thus more and more the production line in Nanchang came into use and around 1960 they are able to produce complete motorcycles themselves with their own components. Thus China was quickly offered a model that meets the requirements of the army. This could be met without stopping much money into the development of a new one. Ural M72 = Chang Jiang M1 After 1960 is a modest development on the CJ to see. The alternator is heavier, a direct copy of BMW Bosch (1970?). The ignition is switched to outside the engine block. The oil filler moved from the bottom of the engine to the top. 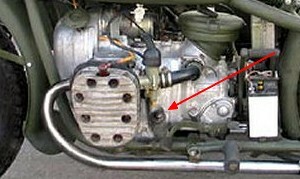 A place just behind the left cylinderfoot, behind the carburetor. 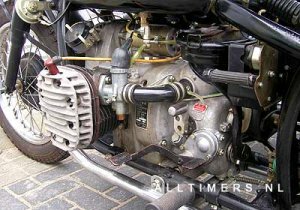 Here and there are reinforcements in the casting of the crankcase made​​, but the original M72 (as Chang Jiang 750 M1) was until the seventies practically unchanged. The German origin of the construction is now about 50 years old. Also in this overview, the developed engines are be seen. 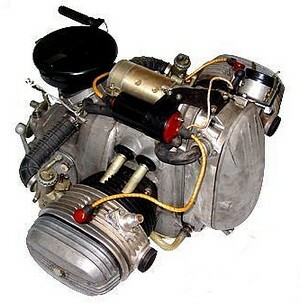 Until today, the Chinese side valve 22 hp with 6-volt DC system is as a spare engine assembled. New blocks from old stock are still for sale. This construction with a production time of 64 years is probably the longest structure ever built. There are some differences which a CJ750 to distinguish from an M72. The Chinese fenders were mounted with bolts and nuts, while in the Ural rivets were used. The ignition is on the outside. Oil filler cap is higher. The Chinese aluminum castings for the engines was much coarser to see. The brackets of the front fender are bent (M72). Actually there are three different models with a number of different engines and in large quantities. Of course there will always be (intermediate) variants in the development period. There are three different models M1, M1M and M1S(uper). They are made with some different engines, Types I, II and III. There too we see small differences. Sidevalve and headvalve, with or without electric starter. Which in turn in 6 or 12 volts. In the pictures there are some variations to see the place where the fender is. From the stories on the Internet shows that there are only two different frames. Frames were made in different production runs and in different companies. As a result, many frames slightly different and it is not easy to find two exactly equal. The same counts for many other parts. There are also some variations in the shape of the fuel tank according to the factory where it is made​​. In 1969 there were some minor changes to the sidecar frame and headlight switch. Also, there was an improved carburetor. About this time also came the tank with built-in toolbox, like the BMW R71 which already had in his production. 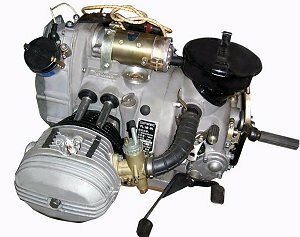 The CJ750 after 1970 thus had a tool box in the tank. This block was almost identical to the original Ural block. 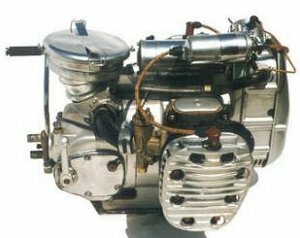 The known side valve 746cc and with a 6 volt system had a power of 22 HP. 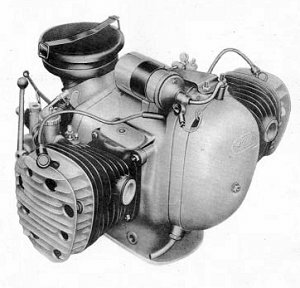 Many of the first engines were later modified with a gearbox of the later type II block because its availability was high and maintenance easier. The block was used in the type M1 from 1957 to 1972 but was produced until 1966. There was such a huge stock of blocks and parts of this first type, the use of this block went well into the seventies. 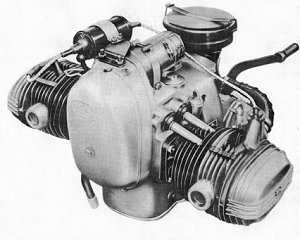 In September 1966, the production of Type II engine and gearbox, but it took until 1972 for this type of the first engine completely replaced. 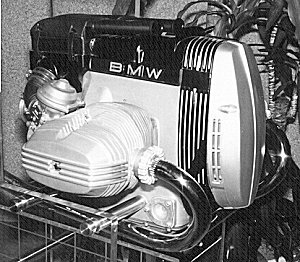 Type II and SV was found in the model M1 from 1966 to 1986 but was much longer used in new engines. There is of the type II block is a 6-volt and 12 volt model. That last block yielded 24 HP in 1986 and was introduced in the type M1M. 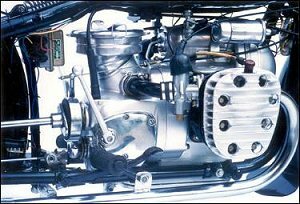 The most visible difference between Type I is a dipstick that is higher, just behind the carburetor which he has become more accessible. Engines with serial numbers of 661802 or higher Type II. Two production companies were merged in 1978 with the resounding name of "ying hong du guo ji xie chang". It began with the production of the Type III block that came under the M1S. The SV turned into a OHV. 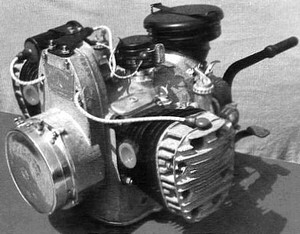 Type I engine with low oil dipstick. Type 1 is easy to recognize. A water-cooled in recent years has emerged. 750 E 750 F BMW kopie? 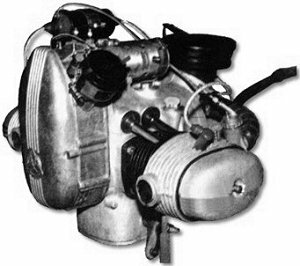 The OHV initially had a 6 volt system and 750-E model was called with an output of 30 hp. Here are just some examples known because in 1980 he was replaced by a 12 volt version that was called 750-F. In 1986 (?) Received the M1M and M1S a 12 volt system and a starter and is then called the 750F. End of 1980 came at the request of the military police a new design, a large 900cc OHV. Of these, however, only a few made ​​and there are few known to exist. The model was called the Chang Jiang 900 and more than ten would not have been made. The OHV seems to have arisen by a thorough study (read copy) of a BMW from the 80th. The shape of the cylinders and cylinder head cover appears to be reproduced. In photographs only similarity is undeniable but it is likely and logical that greater Dnepr cooperation with Russia because that looked a little more obvious. <BMW engine.. On the internet is a story that a Chinese factory delegation visit BMW and swapped engines for a few modern ones which in turn were copied but with overhead camshaft instead of the underlying. Does seem a bit exaggerated story. The BMW was still for sale anywhere in the neighboring countries. Variation on that story is that a German delegation was visiting China and traded two blocks. There are pictures on the internet of racing engines with BMW valve covers and blocks whose names have been changed. Nanchang Aircraft Manufactoring Co." or in good Chinese "chang chang jiang nan gong ye gong Si" started to produce only the engine in the sixties. In the later seventies produced "Nanchang" complete engines. This plant produced in the 90s complete bikes of very good quality and using new parts (NOS: New Old Stock) from the old stock of the PLA (Peoples Liberation Army). These bikes had often a frame from the sixties, a good quality 6 volt system and an engine from the stock of the PLA from the seventies. Later they also produce the M1M and M1S with the 12 volt engines. In the mid nineties changed the original factory once again his name to "nan chang fei ji gong si zhi Zao" but not much later the factory was renamed "jiang xi hong du hang kong gong ye ji tuan". The production of the CJ750 continued to grow and there were some variations on the market that were made in different factories. The two main producers were "jiang xi hong du hang kong gong ye ji tuan" and "nan chang chang jiang gong ye gong si". See a list on this page. Around 1985 began the development of another frame with a lot inspiration from BMW. The first models still had steel fenders and tank. Later on, more plastic parts. Thus arose the term "plastic Chang". 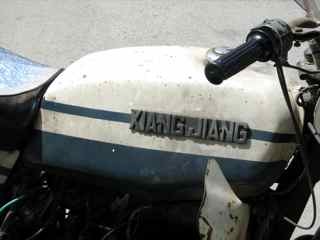 Although this model was very popular with the police and other agencies remained the "classic" CJ750 just in production. In any case for the PLA and probably because there were very many parts. The "Nanchang aircraft factory", the largest producer stopped (officially) the production in 2002 so the stories that he still is made new are not entirely correct. Apparently there is still a company, "factory" called, that assembled new engines from the nearly limitless number of spare parts. On the internet also rotate pictures of the new production of aluminum engine parts. Many companies assembled after 2002 parts from the dumps of the PLA to complete engines and sold nationally and internationally under many different names: Xiangjiang, Shandong, Changhong, Guanjun, Feng Tong, Shihu, Hong Yang, Five Star (England), Yangtze (Germany ) and probably even more. See also: More models(?) on the left. The changes in China makes it possible to easily start your own businesses. Therefore there is a flood of parts on the market to keep machines on the road at low cost. This is quite at the expense of the quality of those parts. It is wise to look carefully whether it is original parts for the PLA, which still gives any guarantee about the quality. Because "Nanchang" stopped in 2002 and needed money, they have sold many production machines and molds to various buyers. These are in turn made now parts. On the internet (Ebay), there are parts to find, but the shipping costs are often higher than the purchase price and the quality is only evident when the wrapper is removed. Because of different production units worked there will always be some work nessesary. That need not be a problem and has always been like that. 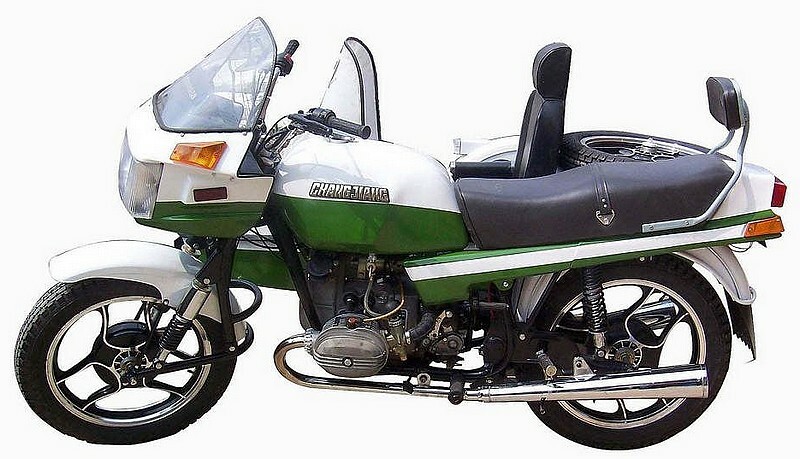 In the Netherlands was a company called Trading Chamco from Eemnes that sold the CJ750. At least, they have printed a leaflet in which it stands. This went to the 12 volt sidevalve model M1M. Only on the pictures the flashing lights were not present. Some people, including Bart Sanders has imported several engines to the Netherlands, whose storys are available on the Internet. Bart is now working under the tradename: MOTORWERK (see link on the linkpage). There are a number of companies in China engaged in selling "new" Chang Jiang's. These are "refurbished" models. Whether in good English: again restored old engines from the armydumps. The quality of this will depend on the business. Many of these engines are simply made from new parts on request. At the time of the rewriting of the story (July 2012) is on the internet to seen that the CJ750 enormously popular with foreigners living in Beijing and especially Americans. They often take their bikes home and you will see now a growing interest in the CJ750. Particularly the BMW look a likes and the copy of the WWII versions are very popular and is often used for the reanactment movement.